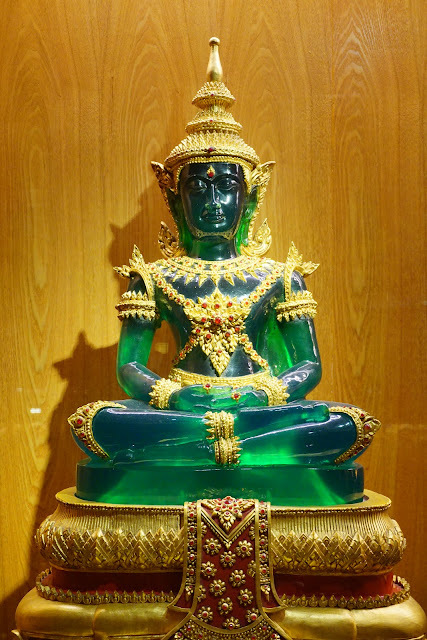 The Emerald Buddha is a figurine of a sitting Budha, that is the is the palladium of the Kingdom of Thailand. The Buddha is made of green jade, surprisingly not of emerald, clothed in gold is approximately 45 cm tall. The Buddha is kept in the Chapel of the Emerald Buddha, which is located on the grounds of the Grand Palace in Bangkok. Legend tells that that the Emerald Buddha was created in Pataliputra, India, which is now the city of Patna in 43 BCE by Nagasena. Other great historians believe that it belongs to the Chiang Saen Style of the 15th century. The legend says that it remained in Pataliputra for 300 hundred years until it was taken to Sri Lanka to save it from a civil war. It was then in 457, that King Anuruth of Burma sent out orders to Ceylon to ask for the Emerald Budha and Buddhist scriptures. These actions took place by the king, to try and support Buddhism in his country. This request was granted, however, the ship that was bringing the Buddha to Burma became lost in a storm and ended up in Cambodia. The Buddha made its way through several hands after that: Ayutthaya, Kamphaeng Phet, Lao and finally Chiang Rai. It was finally in Chiang Rai that the ruler of the city hid it.